It’s small but what I needed for space where it was going. 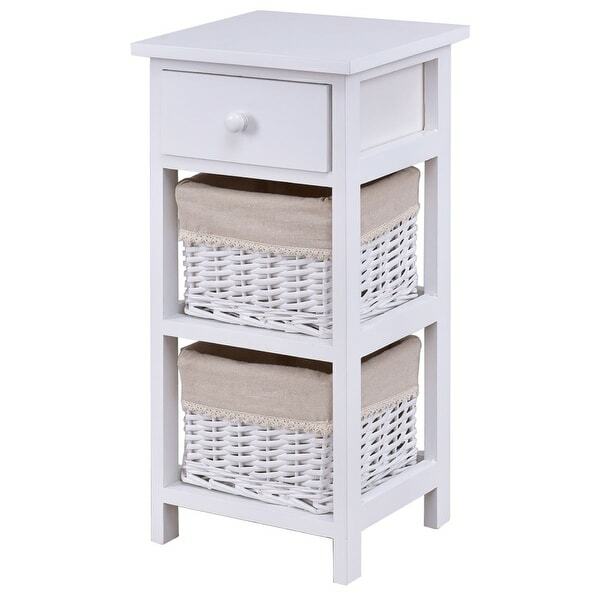 Our bedside table has two wicker rattan baskets, you can put many things in these two drawers, such as your accessories, ornaments, clothes, books, and other things. It also has a drawer with a round knob. You can store your things in this drawer and easily open and close it by the knob. Don't hesitate to buy it! I am using this in my bathroom; it is small enough to not get in the way, and the removable baskets are perfect size to store small necessities, body washes/soap ;q-tips etc. ; everything in reach. Perfect fit for my Grand-daughters bedroom! Looks good but was missing the pull-knobs on the drawers. Please send me two knobs. This table is small, but I expected that (read the dimensions). It was to fit in a small space &amp; it fits perfectly. It came assembled. Some people complained the baskets are too big to slide out-mine were sideways when it arrived. I turned them &amp; they fit&amp; slide easily. My only issue is that one of my baskets had a few (like, 2) broken reeds/twigs that stick out a bit. Smaller than expected but still nice, the baskets fit many items whereas the drawer is a little smaller. I bought two to make up for lost space. Perfect night stand for my 12 year old. It coordinates with her wicker bedroom furniture so nicely. However, it is Extremely light weight. So if you're looking for heavy furniture this isn't it. Have it between the toilet and the sink. Ideal for small spaces. Sturdy and practical, the surface also gives a great space for beauty products. I love this item I just wish the baskets were a little more easy to pull out of the slots. Sometimes they get jammed and I have to readjust them. I love the color it’s true to the picture. I use this in my daughter’s nursery it’s perfect for holding burp rags and bibs. I would definitely recommend it. Works for our small space but is not sturdy - rocks back and forth. Looks kind of cheap. I did replace the knob with a pretty anthropologie one which helps though! The baskets are awkward. They do not slide out. They are also sharp & will cut you. Cute and fits in small space.